While not the ideal software to use for professional desktop publishing, Microsoft Word is still decent enough to be used for a range of applications for the small to medium enterprise. To assist users in uncovering regularly used parts in newsletters I thought I’d link to a couple of highly useful images. The first image is from the desktoppub.about.com site and provides an overview of an earlier design style (that we now trendily call retro). 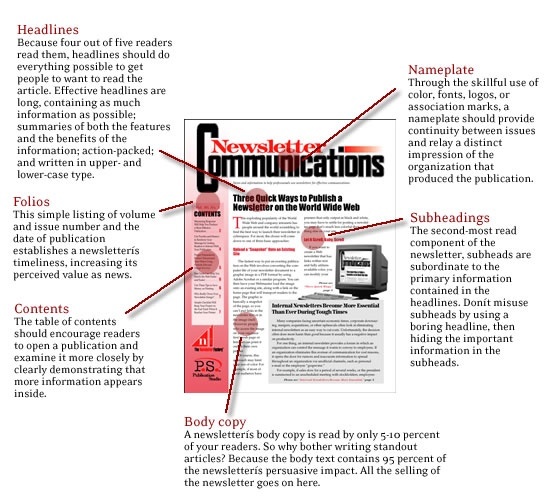 This layout contains all of the classic elements of a newsletter. Notice the use of white-space in and around the copy to assist the reader in their consumption of the content. The second image provides a modern view of the newsletter format. Unlike the previous image more information is available on the front page including the folio and a ,table of contents. The third image shows a simpler, yet still modern, text oriented newsletter layout. Note again that the core information about the publication is on the front face of the newsletter.